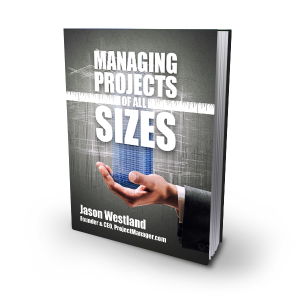 This book explains the difference between small and large projects so that you know how to manage them differently. If you want to learn how to manage projects of all sizes, then read this e-book. You’ll also learn the difference between managing projects, programs and portfolios so that you know what you know how to manage projects at all levels. When kicking off your program of work, the first step is to review your Company Strategy and agree on the objectives that your program is responsible for achieving. This is important, as the objectives are used to guide your projects. If you end up creating new projects that don’t contribute to Company objectives, then they shouldn’t be undertaken in the first place! After kick off, changes in the business often cause a level of chaos in projects. There are change requests, budgets get reduced and resource shortages start occurring. How you react to these changes will determine your level of success as a Program Manager. When this happens, step back and re-assess your program. Outside influences are often the cause and these are things that you alone can fix. Only in exceptional circumstances should you dive into the depths of the program itself and work alongside Project Managers and teams at the micro level. A good Program Manager will instead step back and make macro level changes to influence the success of the program. Now comes the fun bit – scoping out the programs, projects and operational work that are needed to undertake your portfolio of work. Make sure that you scope each work group clearly and accurately – and that there are no overlaps between related projects. Also, make sure that you balance your resources evenly across your programs. Remember, you only have a fixed amount of resource at your disposal, so make sure there are no shortages or surpluses. If your project deadline is practically unachievable, then here’s what to do. First, try and get it delayed. If you can’t, then immediately re-plan your project so you know by how much you will be late. If it’s more than 10% then try and find more resource to help you deliver it more quickly. And if you can’t get the resource, then reduce your scope. Identify non-critical deliverables and get your sponsor to agree that you can complete those deliverables after the deadline has passed. Otherwise, you need to revisit the tasks in your plan to see if you can produce the same deliverables, with less effort than before. Try all of these tricks and see which generate the best result.